Mulching refers to placing a protective and potentially nutritional barrier around your plants to improve health and the garden’s appearance. Compost, pebbles, manure or fabric is ‘mulch’. 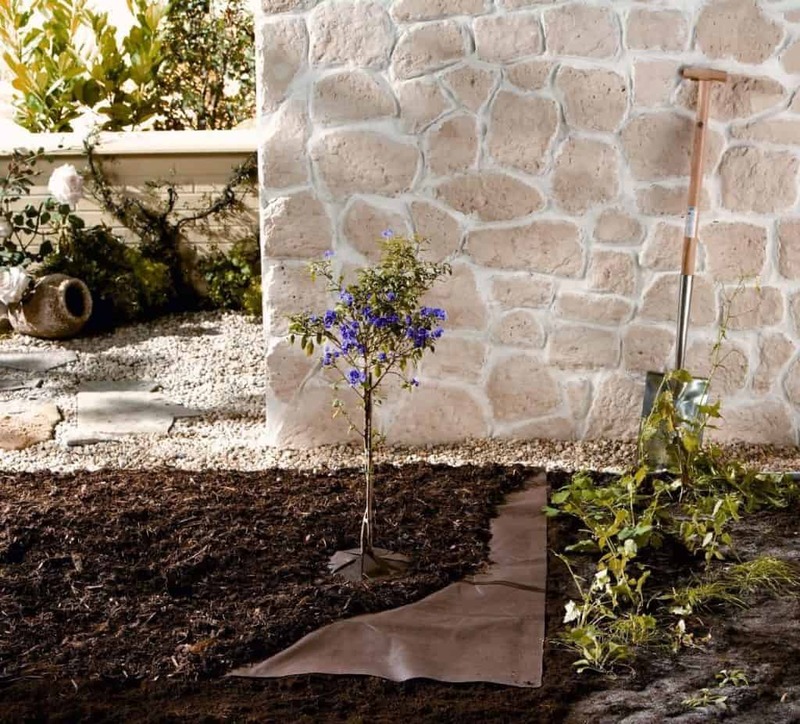 You don’t have to mulch, but you’ll be surprised at what a difference it can make, particularly if you use bio-degradable mulch that feeds the plants as it protects them. 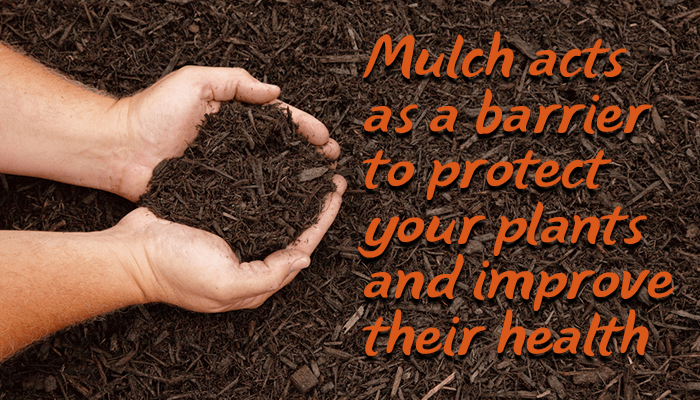 There are many types of mulch that can be used to protect the plants and soil in your garden. It has few drawbacks and can really improve the look both in terms of tidiness and how your plants fare. It’s one of the best things you can do to help your plants, along with watering and dealing with pests. Mulches are available in two types. They are bio-degradable and non bio-degradable. All of them protect the soil from excess rain, drying out, pest damage, and weed growth. These types of mulch slowly break down and release nutrients into the soil. They need replacing once the layer has rotted down, but as a form of slow release food it can’t be beaten. Mushroom compost is a magnificent feast of nutrients, and you may get stray edible mushroom popping up. Wood chippings are one of the smartest to look at and slowest to decay. Rotted manure is another great source of food, but make sure it’s well-rotted. Straw can blow away but it rots down slowly and improves soil structure. Seaweed is another great food source. Grass clippings can work but only if you haven’t used weed-killer and keep the layer shallow so it doesn’t go rotten or slimy. These types don’t add anything in terms of nutrients to the soil, but they protect what is there and last a long time. Slate, shingle and pebbles look smart, they are easy to lay and don’t wash off. Sheets and woven fabrics are great time savers. Choose permeable versions so the rain can soak through and cut slits for planting. Fabric suppresses weeds and holds moisture under the soil. If it looks artificial put bark chipping or stones on top. If you’re using nutrient rich mulch like mushroom compost or manure it needs to be at least two to three inches thick to have an effect. Place it around your plants before or after frosts on damp soils, and weed first or you’ll have dandelions like triffids. Put enough mulch down so it mirrors the length of the branches overhead. If you have lots of mulch available cover up all bare soil, if not go around the plants. Fabrics and sheets are tricky to put in place after you’ve planted so the best option is to use them when you’re creating a bed. Aggregates, like stone and pebbles, can go down at any time of year as can bark chippings. Garden centres and online stores sell mulch, but it can work out expensive if you have a large area and need to mulch every year. Stones and fabrics cost more to begin with but last a lot longer. If you are fed up with the cost of bio-degradable mulch make your own by chopping up your organic waste with a garden shredder or using a mulching lawn mower. If you have a compost heap you’ll know it takes months even years to rot down. If you shred the tough stuff first it takes a lot less time. Useable compost in four months is possible if you shred finely, and because it rots down quickly you’ll find fewer weeds. Young plants love compost and your existing container-bound plants will enjoy an upgrade into a new home, or even a topping up. Each year you should remove an inch of the old compost from your container and refill with fresh. Chop up your woody material in a garden shredder to make perfect protective mulch that will last around three years, and eventually rots down to feed your plants. A shredder also cuts down on the amount of time prunings are left in your garden. The longer you leave that heap the more wildlife is going to move in. Hedgehogs, slow worms, pollinators and birds will all take cover there. When you throw it away, light a fire or otherwise move it, these creatures are disturbed. Shredding it straight away just seems fairer. Even if you don’t need mulches or compost, and you don’t fancy selling it locally, shredded garden waste is much easier to take to the tip than large branches and sticks. It makes less mess in your car and it’s easier to carry. It seems wasteful and pointless to throw away woody garden waste when we spend all this money on compost and mulching. Self sufficiency is the way to go. Your neighbours and friends may well donate their prunings too – rent out your shredder or take the mulch in payment. 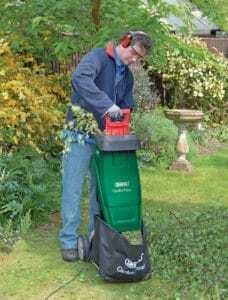 Garden shredders don’t make as much noise as you’d think and they are easy to store. It’s an investment for sure, but if you have a big space with lots of garden waste don’t pay the council to remove it and then buy compost and mulch – chop it up with a shredder and make your garden beautiful. Mulch retains moisture so you’ll need to water less. Organic mulch absorbs water and releases it over time. Both types stop sun and wind removing moisture from soil. Mulch suppresses weeds so your plants get all the available nutrients and you avoid backache. Mulch prevents soil erosion. Rain, wind, animals and watering can wash soil from your growing areas. Mulch keeps it in place. Bio-degradable mulch releases a drip feed of nutrients which means your plants will grow steadily and surely. All types of mulch deter pests like snails and slugs who prefer smooth surfaces. All mulches protect against root damage from frost and heat. Bio-degradable mulch improves the soil texture as it breaks down. Worms love damp, nutrient rich soil and in return they aerate and feed your plants with nutrients of their own. All mulches keep flowers and fruits away from the bare soil. Mulches just look smart, tidy and finished. It’s the visual equivalent of dusting a cake with icing sugar, and who doesn’t want a tidy smart garden? Not really. Mulch is recommended by gardening experts but there are some things to avoid when you apply it. Direct contact with stems and branches can lead to rot and damage. This can weaken the plants considerably. 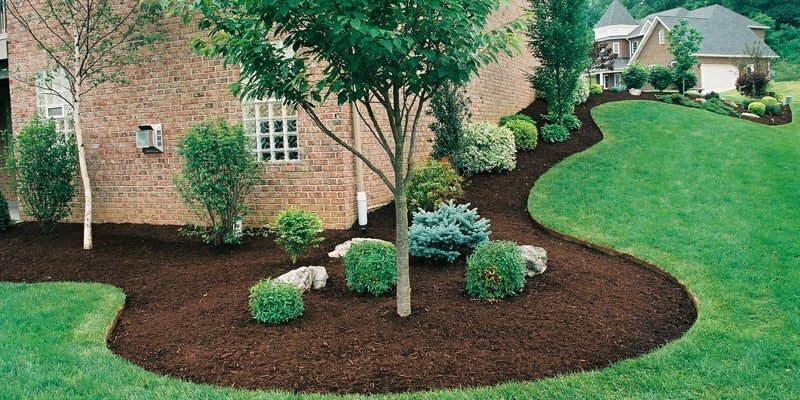 Cheap, low quality mulches can introduce weeds or disease. Mulch lowers the ground temperature so therefore seeds and young plants get off to a slower start. It’s best to mulch around established plants. Some of the bigger pieces of mulch, such as bark or stone, can provide hiding places for slug and snails. You’ll have to water more to start with to ensure liquid reaches roots and doesn’t just soak up in the mulch. You might spot a white line of fungus in your bio-degradable mulch. Do not panic! This is beneficial saprophytic fungi. Leave it alone, it doesn’t hurt and is just having a snack of the rotting mulch. It’ll help break down the organic matter and support plant life. Overall the benefits of mulching vastly outweigh any complications. You’ll see a big improvement in your plant growth if you mulch.